Party Bikes & Cycle Boats For Sale! 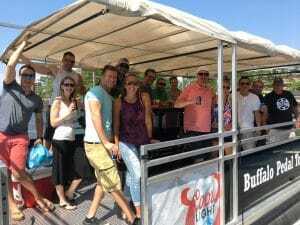 Thinking of starting a beer bike or cycleboat business? No need to spend tens of thousands to franchise. Give us a call. Besides making bikes and boats we will provide you training and support to help you become successful in any market. Since all boats and bikes are custom made to day to call us and make your purchase to be ready for the 2020 season. We have helped businesses in the US and Canada improve their business model with our Pedal Boat and Pedal Bike business consulting service. Doing business with us is easy. We love helping others make their dreams come true. If it’s finding a modestly priced used beer bike, selling your beer boat or bike that you don’t need or getting top notch training to make your business sky rocket we will make you happy you called.